Build stackable credentials with MCC's noncredit healthcare certification programs. Receive a nationally-recognized certification through National Healthcareer Association (NHA) as an electrocardiogram technician or phlebotomist. Each course includes the price of taking your initial certification exam through NHA on campus after successful completion of the course. 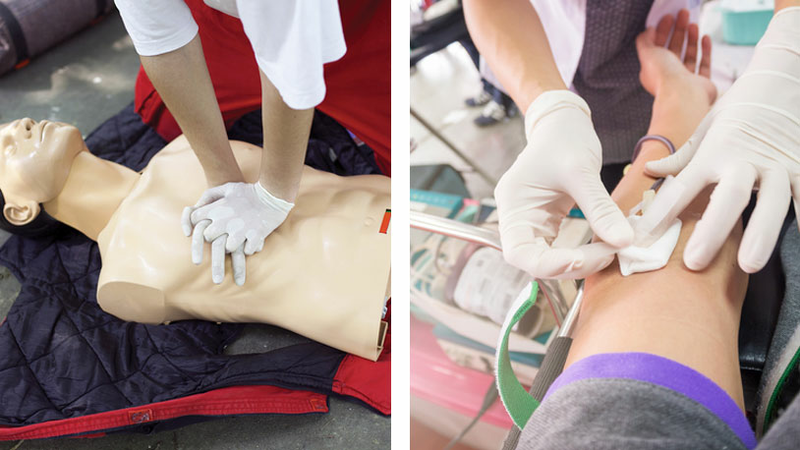 This course meets the requirements for recognition as a basic life support rescuer for healthcare providers by the American Heart Association (AHA). It’s intended for those entering, or currently working in, all healthcare settings. After successfully completing this course, you’ll receive a certification in basic life support CPR and credit for 4.5 contact hours. Prepare to become a Certified EKG Technician (CET)! Study basic to advanced concepts in ECG (also referred to as EKG in the medical community). Learn basic cardiac anatomy and physiology, proper lead placement for 5- and 12-lead, technical aspects of an ECG machine and how to calculate heart rate, how to interpret a rhythm strip, and several advanced concepts working with the 12-lead ECG machines. You’ll learn how to prep a patient for ECG monitoring and troubleshoot ECG artifact. This course is designed for those who have completed CNA, EMT, CPR, or other medically-related coursework. This training, along with your previous certification, allows you to assist the physician diagnosing myocardial infarction, cardiac arrhythmias, and heart rhythm irregularities. ECG machines are used in physicians’ offices, hospitals, clinics, and other health care facilities. Phlebotomists draw blood for tests, transfusions, research, or blood donations. As an NHA-Certified Phlebotomy Technician (CPT), you can work in a variety of healthcare settings and perform critical work in the healthcare field. The job outlook through 2024 shows 25% growth, much faster than average. Median pay: $32,710 per year, $15.72 per hour according to the Bureau of Labor Statistics. MCC’s certification program consists of 60 classroom and lab hours in which you’ll be required to complete a minimum of 30 venipunctures and 10 capillary sticks.